I've eaten at Tony's Family Restaurant many times over the years. Every time I'm there; morning, noon, dinner or after a football game it is always busy. They have a great menu and daily they have great buffet. When we go in the first thing, we do is take a look at the buffet and see what they have. It does vary. Then we have a seat…anywhere we want. On this day we decided to order from the menu because I was Tex-Mex. 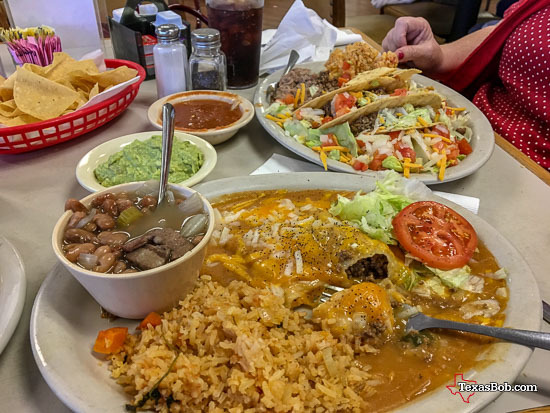 I have never ordered Mexican food at Tony's, but I was concerned because I have never had a bad meal at Tony's. I ordered a combination plate, two enchiladas, one Taco, rice, charro beans and a taco. Clara ordered two Taco's with rice. It was very good. Dessert? Not today, we were too full, but they do have great pies.